Almost As Fast As A Certain Blue Hedgehog! 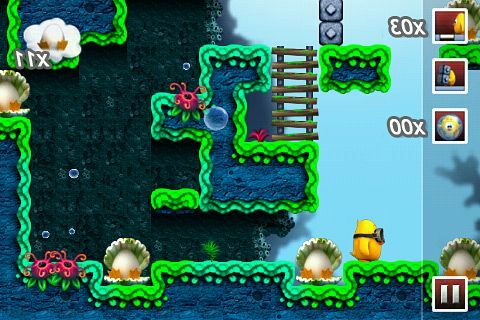 We gave the original WiiWare release of Toki Tori a high level of recommendation in our first review of the game, but does the HD remake of Toki Tori live-up to its WiiWare predecessor? Keep reading to find out! Since we already reviewed the original WiiWare release we will start off by talking about the new features in this version of the game! We will also use this format to review games after they receive game altering updates from now on. 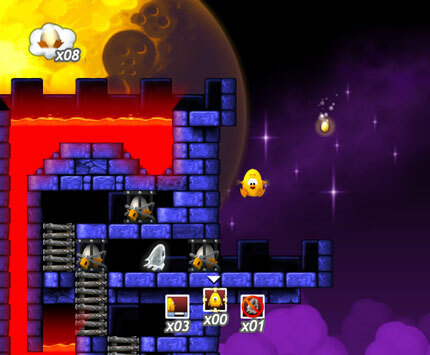 First of all Toki Tori HD has new touch controls on the gamepad that allow you to choose items, navigate the menu, etc. and are a nice touch. The graphics have also been improved and are noticeably more crisp and vibrant than they were on the WiiWare version of this title! 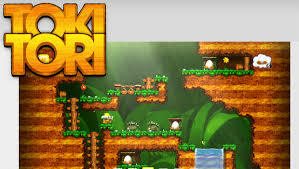 There is on new change that makes the earlier levels more challenging, which is nice, but it makes the later levels almost too hard to enjoy as much as we enjoyed them on the WiiWare version of the game and the change that we're referring to is that the game has been sped up considerably so now Toki and the enemies move at very high speeds making the later levels excruciatingly difficult since your character and the enemies will be running around the level almost as fast as Sonic The Hedgehog which feels a bit off for a puzzle platformer like Toki Tori, however even this peculiar change to the game really didn't severely affect how much we enjoyed the game, but it does make it a little more frustrating at times. Some puzzles are simple, but others require the use of items and the layout of other obstacles in the level to progress further! The controls are simple and easy to learn so you won't have any issues there, however the sped up gameplay in this version of the game can lead to accidentally falling into a hole or bumping into an enemy, but it isn't much of an issue until later in the game. The graphics in the game are cute and nicely detailed with vibrant colors and animated background and foreground objects! The enemy models have fluid animations and look nice, and the new HD resolution makes the backgrounds even more crisp so the graphics are quite beautiful in this version of Toki Tori! 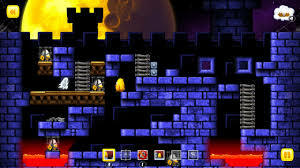 The sound effects in the game are simplistic yet fitting and the music is a nice touch, but is easily the weakest aspect of the game "although the Castle World track is quite awesome"! Make no mistake though as the music is still good and some tracks are quite enjoyable! With fun gameplay, intuitive controlls, vibrant graphics, and nice music Toki Tori is an excellent addition to any WiiWare library and with over 80 levels included you'll agree that this game is loaded with content! On the flip-side the sped-up gameplay can make the later levels in the game quite frustrating which hurts the game's overall score, but if you don't already have the WiiWare version of Toki Tori we still highly recommend downloading this version of the game, especially considering how much more affordable Toki Tori HD is compared to the WiiWare version of the game! Good review, but I think the game runs at normal speed, it was the WiiWare release of this game that had serious slowdown issues. I noticed the fast enemies right away. I haven't played the WiiWare version unfortunately which is a shame when you have about 130 WiiWare games. I always wanted to try it, a demo for this game was missing on WiiWare sorely, it would have sold me on this. However, I bought Toki Tori on Wii U because I liked Toki Tori 2 (also on Wii U) so much. I don't think faster enemies are a problem, because of the rewind feature, and because Toki Tori is still moving faster than them. Since I got it last week I played it almost every day an hour or two. I really love this game. It's almost as good as Toki Tori 2+. Even though it's a remake from a 2008 game the graphics are still pretty. Two Tribes know how to make a charming beautiful art style. But the best thing about this game are the mindblowing puzzles, the sheer amount of detail that went into creating them, and that awesome leveldesign. It's a game for all ages and I cannot recommend this game enough for puzzle fans. Especially for just 1.99€ which is probably the best value in terms of content/gameplay/price on the whole eShop. Looking forward to the other 2 Two Tribes classics on Wii U that follow soon: EDGE and RUSH. 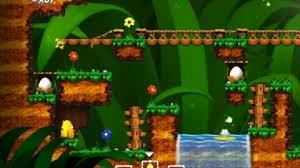 Toki Tori is a great game! The problem you guys are having is because your Wii's are lagging because they are old, you'll notice that with most Wii's that are over two to three years old. This is a very nice review, but is missing a few details. Yes this game plays super slow on an older Wii it has nothing to do with the game itself. This review is very good lol. This is such a fun game! 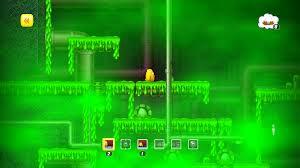 It's much easier than Toki Tori 2 which is refreshing. Good review. I also have problem with game being so fast. This game is awesome. Sweet review dude! I got this for WiiWare and loved it!